But do you know a queen when you see one? She’s here looking all royal. If you look closely enough you can see some of the eggs she recently laid. She’s surrounded by worker bees and capped brood. Supersedure cells look like peanuts, and swarm cells are often at the bottom of the frame. They are both queen cells. Worker bee cells are much smaller. You see some in the pics. 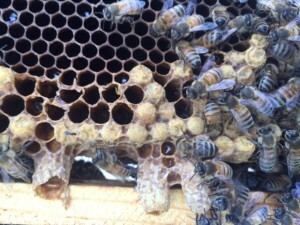 Drone cells are just a bit more raised than worker bee cells, you can see some of those in the second pic. That liquid is honey. 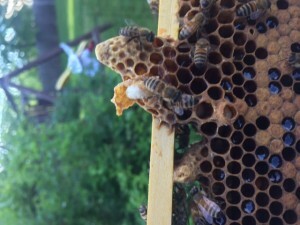 The nursing bees like to keep honey and pollen close by the brood for feeding purposes. When I took these pics, being the newbie that I am, I didn’t realize I had all these queens in the making. 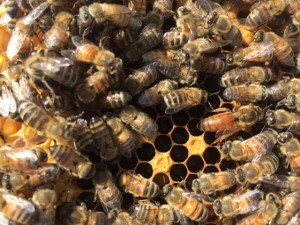 Basically the workers were preparing to flee the hive or felt something was wrong with the queen and needed to raise a new one, and I didn’t get that right away. I think they actually did swarm not long after I checked, but I just missed it. 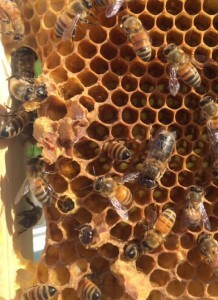 Anyway, I made splits with the queen cells and have five hives now. Here’s something cool. 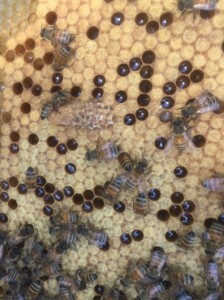 It takes about 16 days for a new queen to develop and hatch. So the cells you see above became the queens and hatching queens you see below. If you look closely you can see the queens making their way out in the first pic to the left. There are a couple of queens making their way out of the cell. They’ll duke it out once they are free; queens aren’t into sharing their domain. May the best queen win! 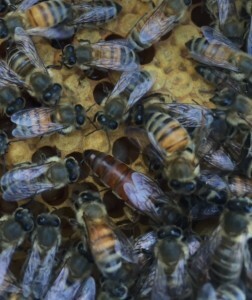 In the second pic is a new queen from one of the new hives. She hatched this week. This is me feeling exhilirated and a little stunned at all the growth. Wowzer! 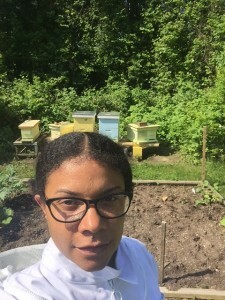 See the the nuc boxes behind me (smaller hive boxes)? Those weren’t there just over a week ago. It just got real, super fast.